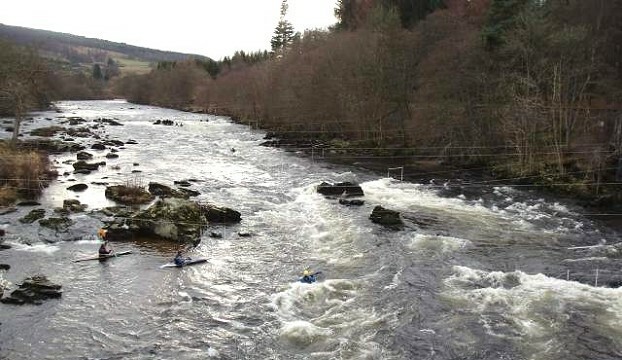 Grandtully slalom is held on the River Tay, as it passes between the villages of Grandtully and Strathtay. At this point the Tay is grade 3 water, about 30m wide and depending on water level can provide some very challenging whitewater. The slalom course usually starts at the gabions, (large metal baskets filled with stones) before taking the top fall, usually run on river left through a narrow right to left ‘S’ type line to avoid a small hole. There is a strong eddy on the right hand side immediately after the top fall that is frequently used in competitions as a testing breakout. Then follows a relatively wide, fast, open section before the middle section of waves and eddies. At high water levels the waves in the middle section provide some good surfing and wave crossing challenges. Moving out of the middle section the flow passes either side of the large rock, right in the centre of the river and known as the boatbreaker, and finally under the road bridge to finish in the flat pool below the bridge. The water level significantly effects the whitewater skill required to compete at this site. At any level it is definitely not the place for your first Div 2 event on moving water, and you need to be confident on whitewater before tackling it. However, it is a great place to test and improve your slalom skills on interesting natural whitewater. The SCA have a set of permanent training gates on the site and across the road on the SCA campsite there is a purpose built toilet and shower block, which can be used on a daily basis as well as by campers. Contact Stephen MacDonald or SCA office 0131 317 7314. Campsite info and booking. To get there, follow the A9 North from Perth, turn left onto the A827 and follow the road signs towards Aberfeldy for 5 miles (8km). View up river from road bridge.